At The Paw Zone, your dog will be a member of the pack. Learn more about our pack leaders! Diane is the founder and owner of The Paw Zone. She has more than 19 years experience in the pet-care industry, from veterinary and retail pet store management to training racehorses. She is very hands-on and you will usually find her out working with the pack or checking in a client. Her passion for dogs led to the development of The Paw Zone. Steve is the first face you see when you walk into The Paw Zone. Steve will help you sign in, fill out paperwork, and direct your dog to the play area. He has more than 10 years of customer service experience and is here to answer any questions. Maureen makes sure that all of our pack members stay clean, safe and happy. She is our "cleaning machine" and takes great pride in making sure The Paw Zone stays immaculate. Maureen has eight years of experience in the pet-care industry and really enjoys working hands on with the dogs. Sarah enjoys working with our more timid dogs and helping them come out of their shell. She loves watching a shy dog come into our pack and become more confident during their stay. Her calm energy radiates throughout The Paw Zone. Sarah has had more than 12 years experience in the pet-care industry. Jamie is just entering the world of dog behavior! She is progressing well in her area of expertise and is even spending Saturdays with our trainer to learn canine body language and behavior. Jackie brings experience from across the animal spectrum after growing up on a 700-acre farm! She has experience showing dogs and breeding cattle. 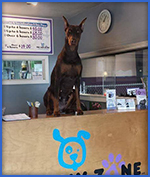 When you enter The Paw Zone, a giant, goofy Doberman pinchsher might welcome you to our facility. Don’t worry, this is just Simon, our beloved mascot (and Diane’s dog)! You can find him in the play area or greeting clients. His favorite time of the day is when new kids come to The Paw Zone. He loves to help with chores and will always be the first in on pool days. Simon is a 2 1/2-year-old Doberman Pinscher who loves being the center of attention. Simon is a happy guy who is on his way to becoming a certified Search and Rescue K-9. He is incredibly talented and takes his job seriously. When he isn’t finding missing people, he loves to swim, do weight pull (up to 320 pounds! ), go to parks, and chase geese from our pond. Summer is an 8-month-old Doberman Pinscher who loves to have fun! Summer is more reserved. She likes to visit people, but doesn’t have to be the focal point. She is a typical puppy and loves to play, play, play. Summer is well on her way to becoming a top-certified Search and Rescue Human Remains Detection Dog (HRD). Such talent for such a young lady! She displays the type of talent a K-9 handler only dreams of. When she isn’t busy working, Summer enjoys chasing Simon, running on our 240 acres, chasing geese from our pond, and chewing up toys. Emmi, Sunni and Lexi are 11 years, 9 years and 7 years old. They are Miniature Pinschers who enjoy the nice, easygoing lives of our home. They come to the Zone once or twice a week because they enjoy socializing but enjoy their beds even more! They love running on the farm on our walks, and Emmi loves to swim. They love going to spend the week at Grandmom’s house! The girls enjoy going for car rides — it doesn’t matter where, just as long as we hit the road!